This page expounds on two models of the real projective plane, one made from paper and glue and the other from rubber bands. While there are many different models of the real projective plane, the two described here are distinguished because they are quickly manufactured using readily available materials. The real projective plane, denoted in modern times by RP^2, is a famous object for many reasons. It is probably the simplest example of a closed non-orientable surface; removing a disc from the real projective plane may yield another familiar non-orientable surface, the Möbius band. The real projective plane was one of the first (if not the first) post-Enlightenment examples of a non-Euclidean geometry. Its particular properties were first studied by Renaissance artists and architects who pioneered the techniques of rendering perspective. Leonardo's Last Supper is a worthy example, although many others abound. The real projective plane is a central object in a classical subject known as "projective geometry", which was an outgrowth of the work of the Renaissance artists and some later geometrically-minded philosophers, especially Jean Victor Poncelet, who undertook to axiomatize its geometry. Over the past few centuries, the real projective plane has undergone tremendous scrutiny, and these days it rests as an elementary example in topology or algebraic geometry. Topologically, it may be described as the quotient space of the closed disc by identifying opposite points on the boundary. It may also be described as the quotient space of the sphere S^2 by identifying antipodal points. Geometrically, the real projective plane is the space of lines through the origin in 3-space. Since every line through the origin determines a unique perpendicular plane, RP^2 may also be defined as the space of planes through the origin in 3-space. One of the peculiar properties of RP^2 is that it cannot be imbedded in 3-dimensional space. Every continuous function from RP^2 into R^3 must necessarily contain self-intersections. In general, therefore, it is not as easy to conceive of RP^2 as, say, the ordinary sphere S^2. In order to obtain a 3-dimensional model, one must reach a compromise between common 3-dimensional intuition and the stark topological properties that RP^2 possesses. One forces this compromise by sacrificing the beliefs that a faithful model must not possess self-intersections or have all of the desired properties that one wishes. The real projective plane exists by mere construction, but we cannot be limited only by what we see. Nevertheless, what we see can help us understand it more. As is suggested by its name, the tetrahemihexahedron has 4+6/2=7 faces. 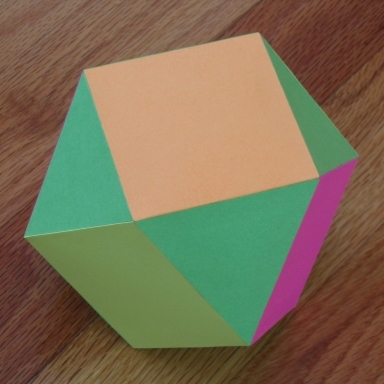 It is the only non-prismatic uniform polyhedron with an odd number of faces. It has 4 equilateral triangles and 3 squares with 2 triangles and 2 squares meeting alternately at each of its 6 vertices. The edges of the tetrahemihexahedron coincide with the 12 edges of a regular octahedron. In fact, one may obtain the tetahemihexahedron by replacing 4 triangles of the octahedron by the 3 squares formed by these 12 edges. Notice that the square faces intersects along "false" edges, these being diagonal lines of the squares. The Euler characteristic of the tetrahemihexahedron is k=v-e+f=6-12+7=1. If one accepts that the tetrahemihexahedron is an immersion of a closed surface, then one must conclude that this surface is none other than the real projective plane. A polyhedron closely related to the tetrahemihexahedron is the cuboctahedron. This uniform polyhedron has 8 equilateral triangles, 6 squares, 24 edges, and 12 vertices. Notice that these data are obtained by doubling the corresponding data for the tetrahemihexahedron. Moreover, the vertex configurations for both polyhedra are topologically identical, with 2 squares and 2 triangles meeting alternately. If one takes the cuboctahedron as a polyhedral decomposition of the sphere, then the cuboctahedron serves as a universal cover of the tetrahemihexahedron. In this case the covering index is 2, meaning that each point on the surface of the tetrahemihexahedron corresponds to 2 points on the cuboctahedron. One may use the tetrahemihexahedron to see that the complete graph on six vertices K(6) may be imbedded in the real projective plane. Recall that the complete graph on n vertices is the graph with n vertices and all of the n(n-1)/2 edges connecting distinct vertices. 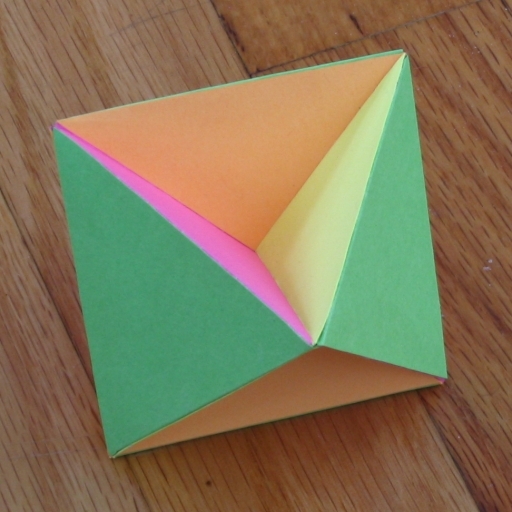 The tetrahemihexahedron already has 12 vertices, and K(6) has 6(6-1)/2=15 edges, so there are an additional 3 edges. These edges are diagonals in the 3 squares, although there are two distinct ways to place them. However, the embedding of the 2 remaining edges is uniquely determined once one of these edges is drawn. Due to the above considerations, one may describe the tetrahemihexahedron as a "topological" model of the real projective plane. Perhaps the biggest deficiency with this model is that one must penetrate the ideas of "immersion" and "false intersections". The 3 line segments where the squares intersect are not to be regarded as edges of the tetrahemihexahedron. One may build this model if one has a large number of rubber bands. It is obtained merely by successively wrapping more and more rubber bands around a central core. Due to the average of forces exerted inward by the rubber bands, the model becomes increasingly spherical as more rubber bands are added. 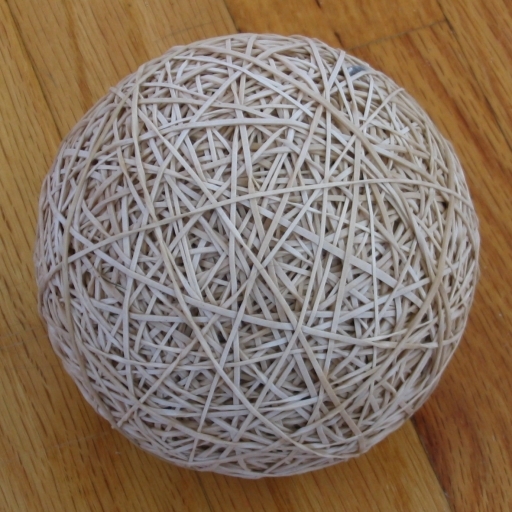 Ideally, each rubber band is placed along a great circle of the sphere. To each great circle, there corresponds a plane passing through the origin and vice-versa. Thus, one imagines an infinite number of rubber bands, one for each great circle on the sphere. The rubber bands in the model correspond to lines and the pairs of cross-over points of a pair of rubber bands corresponds to points in RP^2. This illustrates the "duality principle" of the real projective plane: Every pair of rubber bands, lying along great circles, cross each other at two points. This coincides with the axiom that every pair of lines in RP^2 meet in exactly one point. Also, given any pair of opposite points (consisting of a total of four points) on the model, there is exactly one great circle passing though them and hence a rubber band may be placed there. This corresponds to the axiom that each pair of points in RP^2 determines a unique line. Due to the above considerations, one may describe the rubber-band ball as a "geometrical" model of the real projective plane. Perhaps the biggest deficiency of this model is that it does not look like a surface. Even if one regards the model as being the surface of the rubber-band ball, the model appears spherical. H. S. M. Coxeter. Introduction to Geometry. 2nd ed. John Wiley & Sons, Inc., New York, 1969. James R. Smart. Modern Geometries. 5th ed. Brooks/Cole Publishing Company, Pacific Grove, California, 1998. Oswald Veblen and John Wesley Young. Projective Geometry. 2 vols. Ginn, Boston, MA, 1938.